Starburst Slot is one of the most popular online slot machines for many reasons. It is not only easy to play but its graphics, layouts and features make it worth your attention. You are about to find out how to play this amazing slot for chances of truly winning big. Set the reels to spin and enjoy the show of colourful jewels dancing right on your screen. Produced by the top software developer NetEnt, you will love this spectacular gem of a game. How to play Starburst slot? Starburst Slot has 5 reels and 10 pay-lines with a range of lucrative betting options. To start your spinning adventure, you will have to get acquainted with how the game functions. The 10 fixed bet lines that are available can be set at different bet levels and coin values. Bet Level: The bet level ranges from 1 to 10. It is the number of coins bet per bet line. A bet line win in currency works as follows: It equals the win in coins and it multiplies by the coin value. Coin Values: The coin value ranges as follows: 0.01, 0.02, 0.05, 0.10, 0.20, 0.50 and 1.00. Pick and choose according to your likes. Max Bet: The Max Bet plays the game at the highest current coin value and bet level. AutoPlay: If you want to sit back, relax and enjoy the show, you can always click on the AutoPlay button. It automatically plays the selected number of rounds that you’ve set. Play Both Ways: During your spinning episode on Starburst Slot you will find that the slot machine plays both ways. It can thus double your chances for a big payday every single round. It does so by allowing for a qualifying payout of 3 or more symbols of the same type to appear. It comes into view either from the rightmost or leftmost part of the reels. Starburst Wilds: Starburst Slot plays both ways and can double your chances for a big payday every single round. It does so by allowing for a qualifying payout of 3 or more symbols of the same type to come into view on the reels. It occurs either from the rightmost or leftmost part of the reels. If a new Starburst Wild appears during a re-spin, it will hold in place. It will expand together with any previously expanded Starburst Wilds for another re-spin. The Starburst Wild feature will come to an end if there are no new Starburst Wilds that comes up during the re-spin. There can be up to 2 extra Starburst Wild symbols that can appear after a Starburst Wild launches a re-spin. It activates an extra re-spin up to a maximum of three re-spins. Play Starburst Slot free play on the go with your iOS or Android devices. The game rules as per the starburst slot machine review apply for mobile gameplay as well. There is no denomination selection per line when playing on mobile. You are not yet registered on Irish Spins! Don’t panic, you can create an account today and enjoy its marvellous welcome bonus. On your first deposit, you can triple your deposit! Start your Irish journey with a breath-taking 200% bonus up to £100 plus 50 FREE spins on Starburst Slot. You can thus jump-start your adventure with a handful of Starburst Free Spins. On your second deposit, you can enjoy a 100% bonus up to £250. Finally, on your third deposit, there’s a 50% bonus that awaits you up to a whopping £500. Isn't that great? Irish Spins has even more surprises up its sleeves. The site offers some spectacular bonuses and remarkable goodies! Check out the promotions page to discover the daily, weekly and monthly offers. Ready for a top casino experience on Irish Spins? 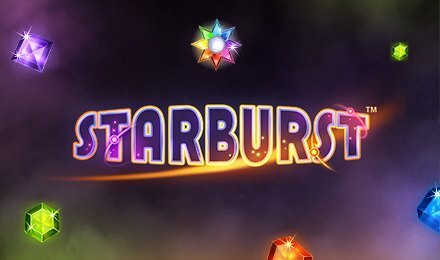 Spin the reels of Starburst Slot for some potentially huge wins.